Every now and then it gets harder to hear all those subtle voices within – those whispers of higher knowing or feeling that seem to guide us, inspiring us into creativity or just getting a sense of the deeper meaning. When we are connected with these inner voices life is magical. They give us a depth to our being that makes us feel really alive while experiences a kind of ‘inner peace’. The last time this happened to me I decided to take myself off for a walk in nature and after a while I put my MP3 player on, listening to my music on ‘random shuffle’, just seeing what came up. I had been feeling a bit numb, not really engaging life fully and retreating inside more than usual. This is of course fine if it is a natural process that you go through, so it’s important not to judge this state of being. However, being guided to simple actions such as going for a walk or listening to some music can help to move through things like this, processing whatever is inside and helping you to get back ‘in the flow’. For me, going into nature quietened some of the ‘noise’ which was preventing me from accessing these inner whispers, and listening to music helped to put me back in touch with my feelings. What is this ‘noise’ and where does it come from? The problem with ‘normal’ life in society is that there’s too much noise. By ‘noise’ I don’t just mean loud things, although that is definitely one contributing factor. I mean that we are bombarded such that the senses are overloaded – traffic, TV, conversation, food, soft drugs (and hard ones). Of course we are always entertained. Appointments, cooking, eating, meeting friends, house work, bureaucracy, entertainment, entertainment and more entertainment. You only have to observe a busy coffee shop. Friends meet for coffee and conversation but cannot cope with the gaps, when conversation lulls or people go for a toilet break. I bet if you stay for a whole day just observing people you will not see one person, if left alone who will not reach for a book or their phone or something else to occupy themselves. Then there’s the more subtle personal noise. Of course our brains are wired to take in information and gaps in thought are few and far between, particularly if surrounded by stimulation. We need to process what’s going on around us and our inner whispers are interpreted through the mind anyway. However, there are other types of inner noise which can be quite disruptive – needs, desires and judgement. These can be a little harder to let go of, even if we recognise their disruption to inner peace. It requires a level of awareness that takes some practice, recognising when these desires don’t serve you, getting to the source of the need,realising yourself through it, and then breaking the programming in the brain. All this noise means that we can no longer hear the inner whispers that make life magical. Consequently the quiet space within is felt to be like a void of emptiness, often so unbearable, that it needs to be filled with outer noise (entertainment). Then the subtlety of life is missed, the senses become dulled and creativity is never fully realised as a spontaneous arising from within, but at best a forced process of logical thinking or problem solving. So, if we want to experience a depth to life far more magical than that filled by entertainment and sensory satisfaction we must do something which may seem a little paradoxical. We must invite the inner whispers to speak up by reducing the noise in our outer life, simplifying our daily lives, reducing ‘clutter’ and allowing time to just do nothing and ‘be’. Of course there will be busy days, and times where you will have much noise around and inside of you, but a few simple things can help reset the balance. Meditation helps, time in nature, exercise and time alone. Or maybe something else works for you. Experiment with whatever makes your soul sing. Be bored sometimes – it’s a good sign. So entertainment doesn’t do it or you right now – great! Use that opportunity to go within and listen. You don’t need to quieten the mind, that’s not it’s nature. It’s simply about being in the moment with whatever arises without judgement. Letting it be until it moves on. Once you’ve struck a balance you may find a curious thing arises. Instead of a polarity between busy, stressful times and times of inner peace and magic, they will begin to merge inside. Sure, on the outside there will still be busy, ‘noisy’ times and quieter times, but inside you may begin to be able to access that place of inner peace where you can hear those quiet whispers even when the world outside you is chaotic. Here is a great meditation by my friends at Openhand on accessing those inner whispers. It's relatively short (20 mins) so it's ideal to use during a busy day to reconnect with yourself. 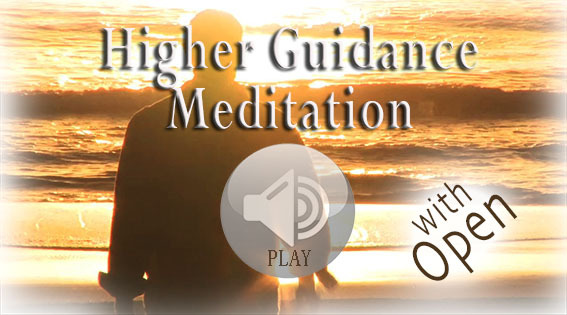 Here is a powerful meditation that you listen to for free, to help you connect with your higher self and draw the lighter, more connected energy down fully into your being that you may benefit from more powerful guidance in your life. Ultimately it will help you become your higher self and live it in every moment. Enjoy!!! Thank you for this article Richard, very synchronistic for me. I'm really happy that it resonated with you Steve. Wishing you well.